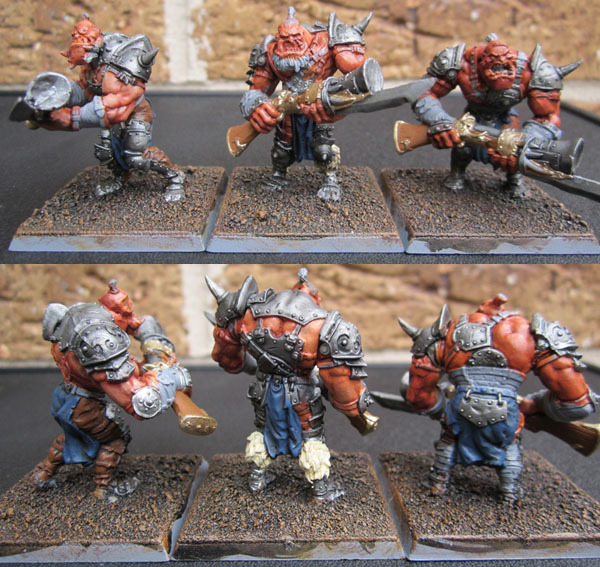 Ogre Shooters | Azazel's Bitz Box. Mantic Ogre Shooters – Blunderbuss and Crossbows – Based! Just a small update this time, but we finally had two days without rain in a row! Two! 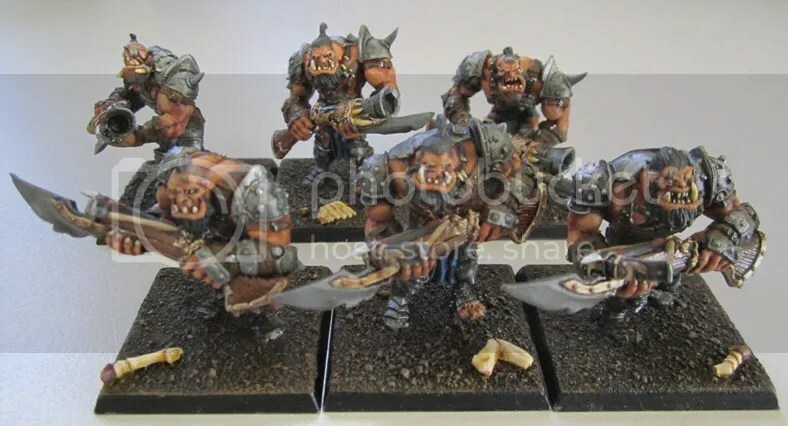 Sure, they directly followed the coldest November day in the last 25 years (it’s spring here, supposedly) but anyway – the day allowed me to finally finish the bases on these guys after finally getting a day warm enough to spray them. Paint-on Vallejo varnish kept leaving some non-matt areas. Hurrah for Testors Dullcote! Mantic Ogre Shooters with Crossbows. 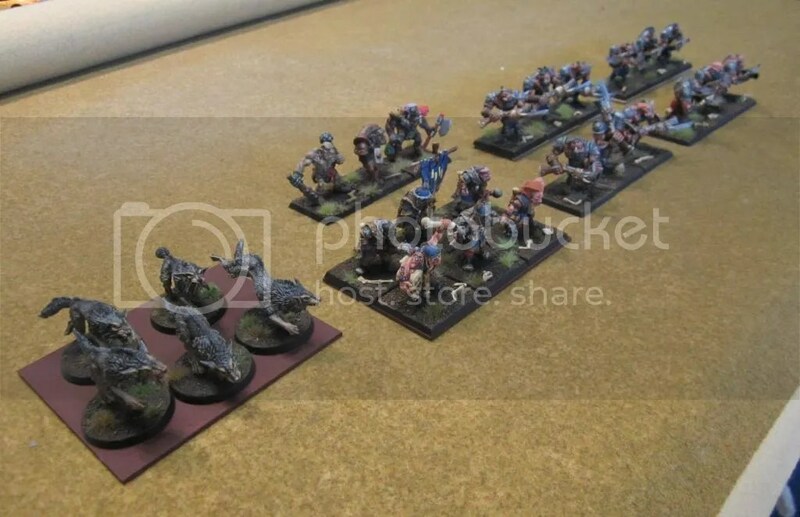 Mantic Ogre Shooters with Blunderbusses. Here’s their previous post. With more photos, but no tufts. 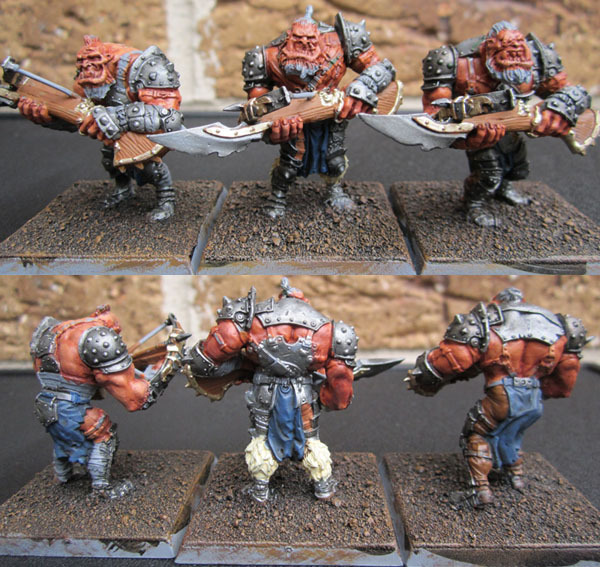 Mantic Ogre Shooters – Blunderbuss and Crossbows – Finished! 1) Too much fine detail. I really like Remy’s sculpts in general, and these guys look quite good if you can get past the Johnny Bravo proportions and knocked knees. The thing is he overdoes the tiny details, which are then shrunk down even more by the restic that Mantic use. There are WAY too damn many buckles and studs on the leather straps and such. 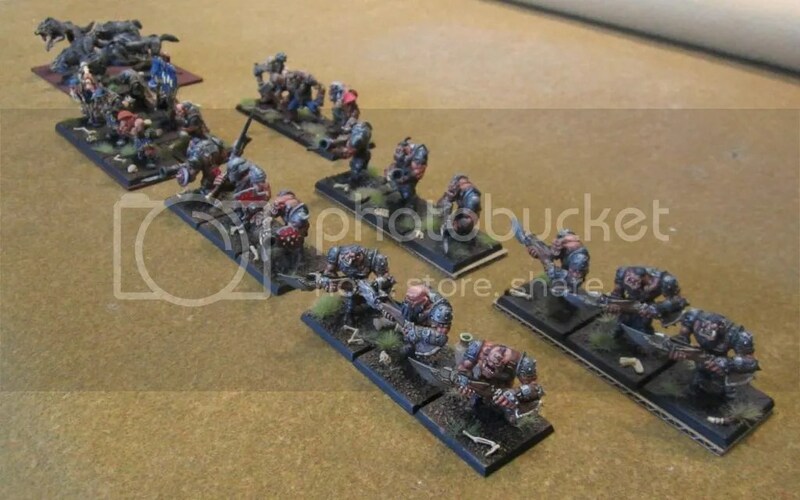 If there were just a couple of figures, as in individuals, or commander-types then I’d have no problem here, but as rank & file, it’s just maddening to have to paint. 2) Arms across their bodies – Since these are missile troops, they have their arms across their bodies as they hold their blunderbusses and crossbows. it exacerbates the issues above and makes them far, far more painful to paint than open-armed ones like the melee models would be. 3) Not enough variety. 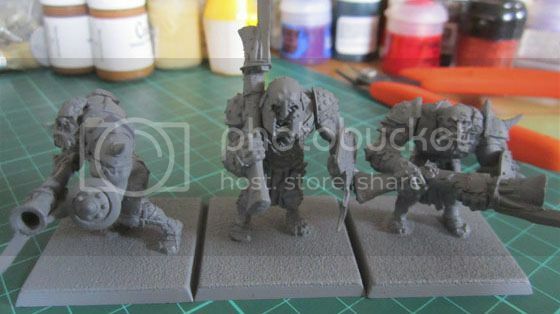 Three torsos used and reused for the BB, Xbow, 1h&S, 2h and “hero” models that are also quite specific in their details and poses, paired with a total of 6 unique heads – only 2 of which I particularly like, and a couple that are awful. Then one set of arms each for the crossbows and blunderbusses. This is going to mean a hell of a lot of repetition. There;s also not a lot that can be done with them. 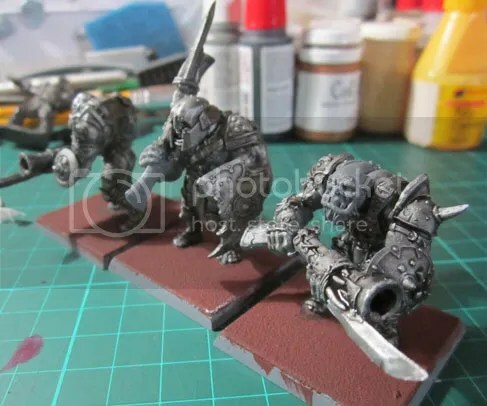 I’ll be chopping topknots and trying to figure out how to apply helmets to these guys as I assemble more, though the GW OK models’ heads are a touch too large to use. 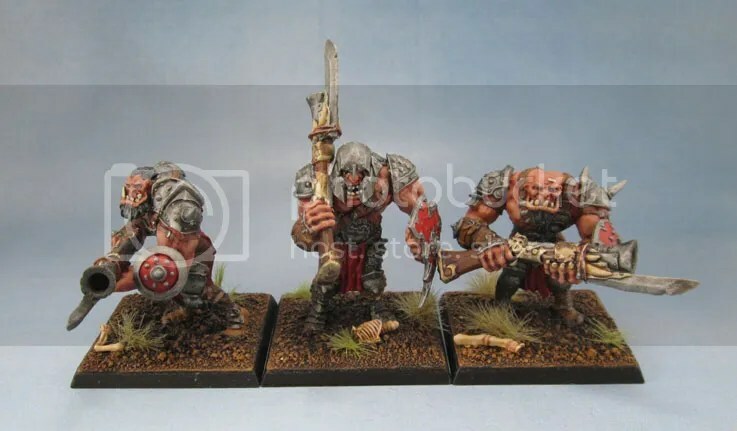 Yes, the GW OK bodies are also very limited in posing, but they seem to make up for it with a large variety of arms, weapons, heads, gutplates and the like. 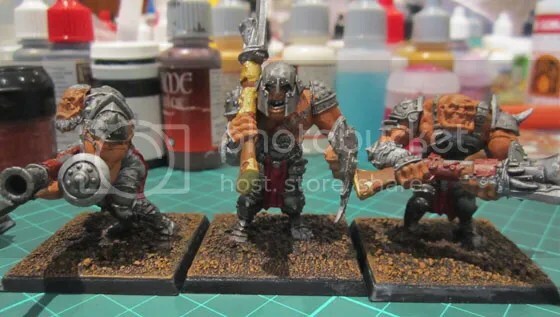 4) I need to paint another 6 of them – 3 more of each. D’oh! 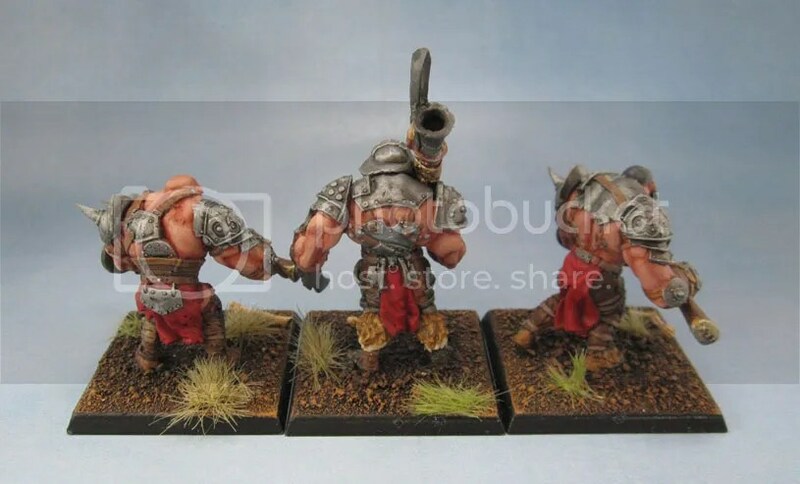 I’ll be doing them next, so I can put painting Mantic’s Ogre Shooters behind me for awhile. Anyway, enough of my bitching. At least the bright side is they turned out pretty well, so I’m happy with them in the end. I did enjoy assembling them and even needing to heat up each piece in very hot water was a bit of fun, as it allowed me to somewhat vary their arm poses slightly. The light is a bit glarey in these photos, but it’s the best I could do today. It’s creating a bit more contrast than I’d like, but that’s life. The figures still need a couple of final things done to completely finish them. First they need to be varnished. 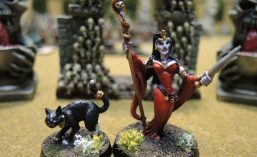 I wanted to get the photos before the matt varnish flattens out my blending – something that always annoys me – and following that I’ll be adding some tufts (sorry Cash – I like ’em!) 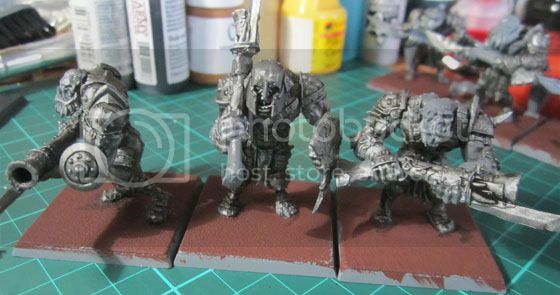 and then some weathering powder to dirty up their feet and blend them in with their bases a little. I also found my Pin Vice this morning, as well as some larger bits, so I drilled out the barrels of the blunderbusses. 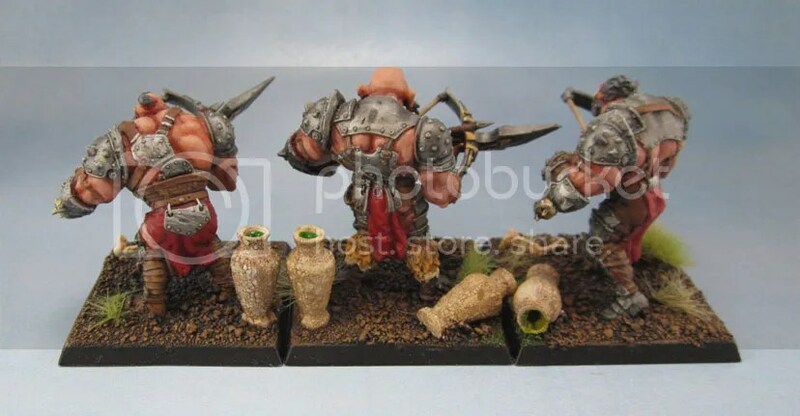 I think I mentioned it before, but I ended up basing these on Citadel 40mm square bases for consistency in the force, which is largely made up otherwise of the classic GW models.